"DEMETRIA DEVONNE LOVATO!" A familiar voice screamed, from Maddie&apos;s line. "DID MADDIE JUST SAY YOU LOST KESANDRA? ALREADY!" 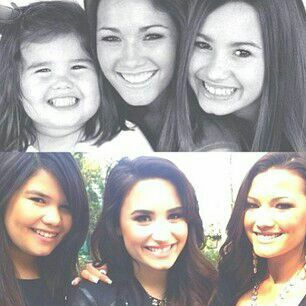 Demi&apos;s face went white as her older sister came into view. "Hey, Dallas." She cried happily, forcing a lightness into her voice and putting on her most innocent smile. "Don&apos;t you &apos;hey, Dallas&apos; me!" Dallas snapped, glaring at Demi. "You have only been there for two days!" Demi sighed and looked at her lap, biting her lip nervously. "Demi, explain. NOW!" Dallas cried, making Demi flinch. "I was just trying to get through to her," Demi protested. "So?" Dallas said, a little confused. "What&apos;s wrong with that? Why would that make you lose her?" Demi glanced at Maddie and back to Dallas, praying that Dallas would understand what she meant. "Okay, I&apos;ll call you." Dallas sighed. "What?" Maddie groaned dramatically. "You mean I don&apos;t even get to know how Demi messed up?" "NO!" Dallas and Demi yelled together. Maddie rolled her eyes and glared at them both. "Okay, okay! Wow guys, don&apos;t have a cow! But remember, she&apos;s my cousin too." Maddie complained, getting up to leave. "I hate being the youngest!" Demi and Dallas smirked at their little sister as she started to go. Suddenly there was a bang downstairs and the sound of somebody cursing. Demi jumped up and flew downstairs, not bothering to turn Skype off. Maddie made a &apos;ooh&apos; noise and Demi left. "Kessie is so dead when Demi gets her hands on her!" She giggle, making Dallas raise her eyebrows at her. "What?" Maddie cried. "Well, she is!" Demi stormed over to Kesha and glared at her. Kesha barely glanced at her, keeping her eyes fixed on the TV. "KESANDRA LEONNA HART-COOPER!" She almost screamed. "WHERE WERE YOU?" Upstairs Maddie snickered, trying to stifle a laugh. "What&apos;s up with you?" Dallas asked, pushing her slightly. "What a mouthful," she spluttered out. "So immature," Dallas teased and went back to listening in on Demi. This wasn&apos;t hard, as Demi was yelled very loudly. "I WON&apos;T ASK YOU AGAIN KESHA! WHERE. WERE. YOU?" Demi screamed, making Maddie ask why she was saying &apos;Kesha&apos;. "I was right here," Kesha replied blankly. "YOU WERE WHAT?" Demi cried, anger overflowing her body. "I CALLED YOU! WHY DID YOU ANSWER?" "BECAUSE YOU CALLED FOR &apos;KESSIE&apos;! KESSIE&apos;S DEAD, SHE DOES EXIST ANYMORE!" Kesha screamed back, finally turning to look at Demi. "GET OUT OF MY FACE LOVATO!" Demi winced at that, but tried not to show the hurt on her face. "Go to your room," she growled softly. Kesha ignored her and carried on watching TV, keeping a blank face. "YOU AREN&apos;T MY MUM DEMI, I HATE YOU!" Kesha yelled before running out of the house. Demi was about to follow her, when she spotted her going to next door. She signed and went upstairs, finally remembering that Skype was still on. "Hey," Dallas said softly. "I&apos;m sorry I was so hard on you," she apologized. "I guess Kessie&apos;s more difficult than I thought..."
"I already told you," Demi said softly and went to shut the laptop lid. "She hates me..."